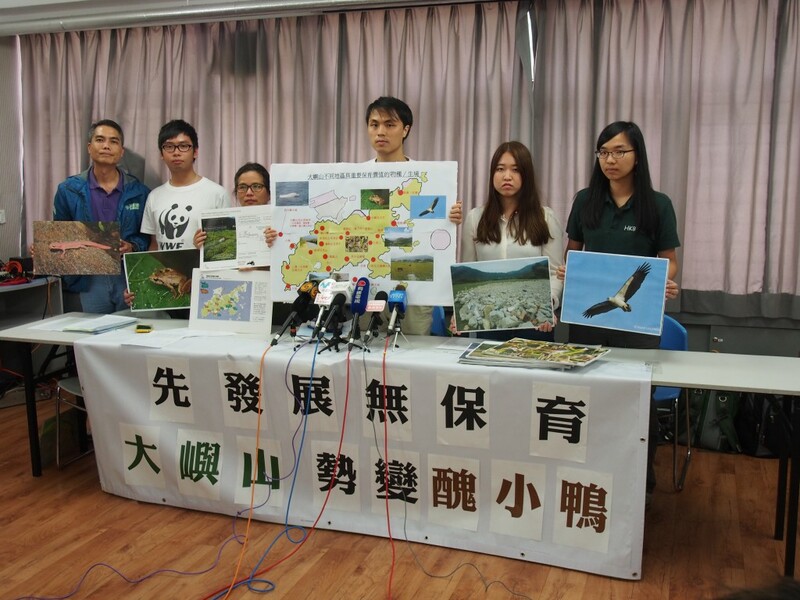 Green groups strongly object to any large-scale development such as East Lantau Metropolis and the strategic road systems and request the government to make conservation the top priority for Lantau development, to safeguard the rich biodiversity and the close relationship between humans and nature on Lantau. The groups have presented a list of conservation measures (including traffic restriction) it urges the government to implement. The First-term Work Report made by Lantau Development Advisory Committee (LanDAC) has been submitted to the Administration on January 2016. This report proposed massive, “creative” and unassessed developments such as East Lantau Metropolis, super large-scale strategic road systems and numerous tourism facilities including viewing and stargazing facilities for the Sunset Peak. The proposed developments will have disastrous impacts on the ecosystem and the local community, and destroy the tranquil environment and magnificent landscape of Lantau. Because of its unique location, Lantau has rich and diversified natural habitats such as low-lying wetlands, montane grasslands, freshwater streams and soft coral marine habitats. These habitats breed many rare and endangered species such as Chinese White Dolphin, Horseshoe Crab, Oval Halophila, Romer’s Tree Frog, Common Cerulean, Ayu Sweetfish and Brown Fish Owl. The most valuable thing is that human can live with nature closely. Bovine on Lantau was accepted as “heritage and landscape as human values” by United Nations Educational, Scientific and Cultural Organization for harmonic human-bovid relationship. This can show Lantau is definitely a nature treasure for us. However, this First-term Work Report claims to support sustainable development but no positive conservation measure is proposed. LanDAC even proposes to relax the traffic restriction on closed roads, and establish a strategic road network connecting west of Hong Kong Island, South Lantau, North Lantau and North West of New Territories. These measures would increase the development pressure by giving false hope to land owners, hindering any conservation plans and actions on Lantau, especially in ecologically sensitive rural areas where there is no Development Permission Area (DPA) plan and no statutory protection could be done by government, such as South Lantau and part of North Lantau. As a result, eco-vandalism has long been proliferating with impunity on private land without DPA plans, even in ecologically important wetlands like Pui O. 3. Include any development plans on Lantau in the on-going “Hong Kong 2030+ Towards a Planning Vision and Strategy Transcending 2030” study and carry out a comprehensive Strategic Environmental Assessment for endorsement of all the proposed and planned developments on Lantau. 1. New roads should be well justified, assessed (in the context of environmental impacts, cost effectiveness and public interest), and the public should be consulted before. 3. The construction of East Lantau Metropolis and the associated strategic road system is not well-justified and will cost a huge amount of money, having a very high potential to become new white elephant project.